I’ve tested and tried numerous powder foundations. Nothing comes close to how great this foundation is. Check out the best powder foundation review below! First of all PurePressed Base is a Jane Iredale product, and her products are amazing. This foundation is natural, so you don’t have to worry about putting nasty toxins on your face. This stuff is pure as can be. It even has SPF built right in, so don’t worry about sun damage and skin aging. When you put this foundation on it is so smooth and weightless, you’ll fall in love like I did. Any spots or discoloration you have on your face will be covered instantly, and you won’t have to use much product. I wear this foundation every day, and won’t touch anything else. It’s so effortless and does the BEST job. I’m so glad Jane Iredale came out with this foundation! Really, I’d say absolutely nothing. It’s that amazing. If you have really dry skin this powder won’t add a ton of shine, which may be an issue for some people. PurePressed Base for my Face! I’ve been on the prowl for that perfect powder foundation for ages. I’ve tried the brands: Glo Skin Beauty, Colorscience, Laura Geller, 100% Pure, W3LL PEOPLE, LORAC, Mineral Fusion, CARGO, Clinique, BECCA Cosmetics, PUR, Stila, and so many more. Nothing works wonders like the Jane Iredale powder foundation. It’s truly the best, and you won’t want to use any other foundation ever again. 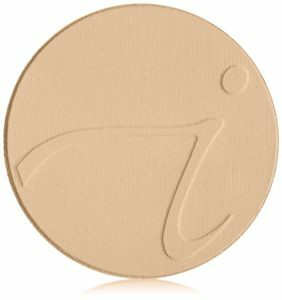 By KatyIn Lady and a BlogTagged best all natural foundation, best natural foundation makeup, best natural makeup foundation, best natural organic foundation, Best Powder Foundation Review2 Comments on Best Powder Foundation Review – It’s Silky Smooth! Previous Previous post: Best Soft Leggings – So Comfy!